Hi Everyone! I can't believe it has been so long since I last posted. The past six months have absolutely flown by! I really enjoyed my classes last semester and I have a lot to share with you. I am very excited for this post because I am revealing a project that I have been working over the past several months. I was hired by my friend Sandra to decorate her oldest daughter, Jolie Ana's room! The whole process was so special because not only was this my first design job, but Jolie Ana happens to be my long time student. Jolie Ana's room was pretty bare when we started, but had a lot of potential. Her room has three zones: the sleeping area, the office area, and a loft. The loft is the only area that is not yet finished. We are still working on that space and I am really excited to photograph it and do a post on it once its done. Jolie Ana described her style as "beachy boho" and wanted her room to reflect that. 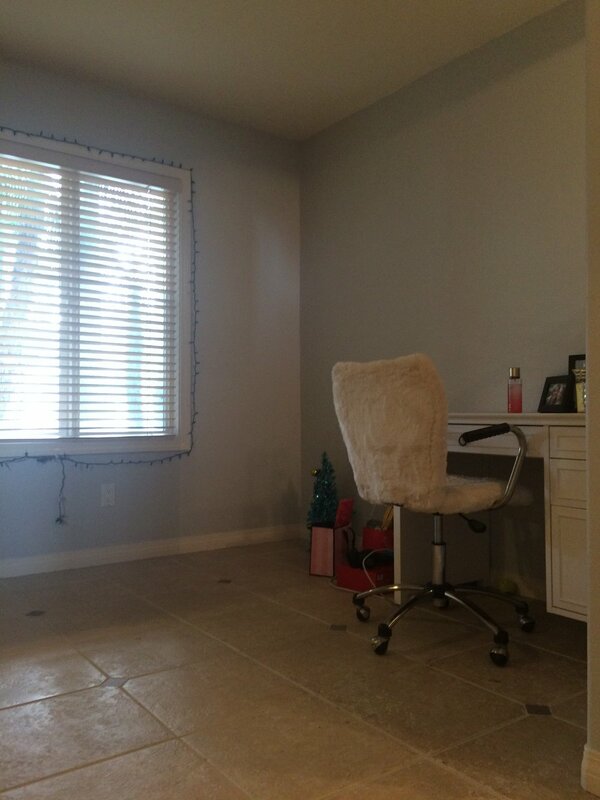 We were working with the existing paint color, flooring, and her Pottery Barn bed and desk. I started by making a Pinterest board with images that reflected the vision that I had for the room, and got Jolie Ana's feedback as to what she liked and what she didn't. Then Sandra, Jolie, and I sat down and discussed what solutions we needed to address in order to make the room as functional as possible. As you can see, she did not have any storage, or anywhere to work or sit. The desk was full of items that needed to be stored elsewhere, and she didn't even have anywhere to eat a snack or work on her computer (hence the laptop and her lunch on the floor). The opening to the closet connects her room to her sister's room, so we needed to cover that in order to give her some privacy. That bed! I would have killed for a bed like that as a teenager! I added the gauze canopy to make it feel like a cozy cocoon, and dressed it up with firefly lights to add a bit of whimsy. The bedding is from Urban Outfitters and the pillows are from Urban Outfitters and Target. Jolie loves laying in her bed with the lights off in her room with just the firefly lights on when she is relaxing. I added a marble topped side table from Target (the same that I have in my room) so that she has somewhere to set things when she is in bed. Its small size leaves plenty of space for traffic flow through the opening between the two areas. Its also light and easy to move since the bed has a trundle underneath for sleepovers. The dresser is from West Elm, and I am in love with it! I mean if I were to marry a dresser this would be the one! It definitely adds some mid century modern flair to the room. I styled the top with the pineapple lantern from Urban Outfitters, a glass and gold box for her to store her jewelry, a family photo, and some other accessories. Next to the dresser the rattan basket is used as a hamper for her dirty clothes. The chair by the staircase is an outdoor chair from Anthropologie and it provides some additional seating. The gold table is from target and adds some textural and sculptural interest. The gallery wall across from her bed is a collection of artwork from Minted, Etsy, and Target. I chose to mix up the style of frames to add for a more eclectic look. I also prefer to cater the frame to the individual piece of artwork rather than just matching them all. We chose images that reflected Jolie's free spirited nature, her love of the beach, and her passion for dance. Onto the office area... I think the curtains with the turquoise pom poms are my favorite feature of this side of the room. We installed an extra curtain on the entrance to the closet. Our original plan was to put a folding screen there, but due to the small footprint of the area, we decided a curtain was much more space efficient. The round rug covers the majority of the tile floor and adds some softness to the space. Our original plan was to hang planters from the ladder, but we decided we liked it as is and left it alone. Unfortunately due to the low lighting, this side of the room was tough to photograph. The white shelving unit is from Ikea and holds all of her books, her record player, and some other decorative objects. Her desk got a lamp (which is not pictured because we used it to light the shot), the circular wire shelving rack above, a mirror for her to do her makeup, and a caddy to store her pens and pencils. I was so happy with how everything came together, and Jolie Ana loves her new room, which is the best part! I love this kid to the moon and back so to be able to do this for her was so rewarding.